Before you can make a thorough decision on what food is best for your cat, there are a number of things you have to take into account concerning the needs of your cat. That’s why we have included a guide in this review to guide you to the best choice for your cat. We have also included a comparison table to the different cat food we find are best for easier comparing the many options you got. What Cat Food Does My Cat Need? Is My Cat Spayed or Neutered? Does My Cat Have Health Issues and/or Allergies? Cats come in many different breeds from breeders and then there are many different cats that are just mixed up properly in their gene pools. Some cat breeds or cat mixes have certain health issues while others don’t. Health issues can mean that certain foods might work better than others. Type of cat also means whether your cat is long-haired or short-haired. Long-haired breeds might get more hairs in their stomach through grooming than the short-haired ones. Certain foods will be helping your cat better with passing these added lengths of hair in their digestive tract than others. Some cats might be more vulnerable for certain allergies than others too. 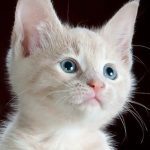 There are just so many different types of cats with different types of needs regarding food, that it is hard to be absolutely sure what your cat would need. A visit to your local veterinary clinic might help out. Your veterinary can determine the health of your cat and what type of food your cat might need. Saying that, do keep in mind that vet’s also do get marketing managers and sellers from different manufacturers on their doorstep and might be trying to sell you something right out of their own stock. Spayed or neutered cats have different food and nutrition requirements than the ones that are not. I would never want to have a cat that isn’t neutered or spayed as it is a lot of added drama, but this type of difference makes a difference on the food need at least. A cat that has not been fixed is way more hyperactive and will burn more energy and eat more than those that are spayed or neutered. Certain cats are having certain health issues or allergies to certain ingredients in food types, so you will have to watch out for that as well. If a cat for example is having a disease such as diabetes, you have to be careful with the sugars in food. Sugars might come in different forms added to cat foods, best is to steer away from them. Cats can also be allergic to certain ingredients. Common allergens the non digestible ingredients such as corn, peas, potatoes and wheat. Obese cats should probably be on a light nutrient diet or at least on food that doesn’t make them more obese. Obesity in cats is very dangerous and threatening their overall health. What you want to do is try to reduce their weight substantially through activity and the right type of food. There are also options for feeding an obese cat something very nutritious, but it means you will have to reduce the amount of food they receive per serving and possibly you might even have to reduce the amount of servings per day. So keep that in mind when shopping for a proper food for your cat. By nature cats need raw and freshly caught prey. They catch mice, rats, birds and rabbits perhaps even. Most likely even more, but that are the most obvious types of prey you would find your cat do in your neighbourhood. Eating a prey whole, hair/fur, flesh and bones, also means they are eating a little more than just meat. Going by the ingredient lists of most cat food, you will find that these manufactured products do not even come close to nature. A lot of the manufactured food is also based on a cooked and dried out version of that same meat. Dried food, means there is little to no water content. I am not expecting you to catch mice for your cats on a daily basis to feed your cat, but you should definitely consider the nutritional requirements when shopping a new cat food for your cat. Whoever got it right on what is best for your cat is a difficult story and it is heavily opinionated. We simply have to trust what the manufacturers of cat food come up with and hope that it will work out. Before and beyond the 1980s there were a lot of cats getting blind. It appeared that cats need taurine to not go blind. This was later added to cat food and it solved the problem. The natural food of the cat had taurine by nature, but our manufactured food caused the problems. These and more problems have been resolved. In our review we are trying to give you options to choose from, rather than just coming with one or two options, we come with the best of different segments. What you should feed your cat also depends on your cats age or in what life stadium he or she is in. A kitten needs a lot of nutritional values for growing properly, while adult cats can do with less. An older cat might need a very specific diet to keep in shape and a queen (mother that is going to have kittens soon) has a very high nutritional requirement too to let the kittens grow optimally inside her. If you are still unsure after reading this guide, we suggest you to consult your veterinary to get a more specific needs advice for your cat. The endless discussion on whether cats should eat wet vs dry food or raw vs dried and boiled is a difficult one and it is for you to decide whether you want to go with either. It is also a wallet question, for everything purely raw or mostly wet food is also (more) expensive. Raw foods add also an extra challenge for you as a cat caretaker. Since its raw meat we are talking about, you need to make sure you are handling the food in the right way (think cross contamination, storage in the fridge, serving, serving-time etc). It is more complicated than one would think. Wet cat food can be a problem solver to be in-between, but most cat foods come with too much added salt or have other additives that could give your cat stomach problems. You will have to weigh in the pros and cons of either food type and you will have to test out what works best for both you and your cat(s). For us, giving wet cat food alone is not going to happen. It is simply too expensive and we cannot get the best of quality wet cat food here. For us in Norway it is also difficult to get access to raw cat food and it is difficult to deal with in a multiple cat household too. We tend to go for a mixture of both dry and wet cat food and balance it out throughout the days. For example, we give them usually dry food in the morning and a portion of wet food in the evening. Some cats do need more wet cat food and others prefer more dry food. Dry food (kibble) is just simply the easiest for us to feed right before we head off to work. Wet food comes in packages usually of about 100g a piece tops. Many wet cat foods are not whole foods, but rather complementary, which further adds to the problem of finding a good wet cat food. Raw cat food needs a short-chain transport, because the foods come frozen. They need hence time to thaw out before you can serve them and they stay fresh only for a couple of hours. I am not saying you shouldn’t go for it, by all means check out Raw Paws Pet Food if you happen to live in the US. I am saying that it can turn out to be an expensive way to feed your cats and it is also a more complicated one since you are dealing with raw meat. Dry food can be cost effective, but it also means your cat needs to drink adequate amounts of water to stay optimally hydrated. Cats are by nature not great drinkers, so this can pose a problem for your cats health. On top of the hydration issue, there is the difficulty with manufacturers that produce foods at different levels of quality. Some use grains, others use vegetables, most use amounts of sugar and salts and other ingredients that are potentially harmful to your cat. How are you supposed to know what cat food is the best cat food for indoor cats? We have looked at different brands of cat foods for indoor cats and taken their nutritional requirements into account to make a comparison of them all. We have also looked at the price point for your wallet, which is not unimportant for most cat lovers. As I said before, you could definitely serve your indoor cat food type that is really meant for an outdoor and active cat, but you have to keep in mind how much you are serving to your cat versus the amount of activity your indoor cat participates in. Cats that play a lot will burn more calories and can therefore eat more calories, while cats that sleep most of the day, will burn less. Manufacturers are required to display ingredient lists in order of weight. So when meat based proteins are mentioned in the first three ingredients, you are generally on the right track. There are so many cat foods to choose from. How will you know what food is going to be good? Should you just buy the cat food they sell at the grocery store? Or should you go to the pet store and get the best they got? Or is it the vet that knows best? Maybe you even need to make your food yourself? We can’t really answer that question, for grocery stores might sell good products or bad products. A veterinary might actually know what they are talking about or have had lessons in marketing to sell you something that makes them most money. It is a difficult one to answer. We however want to come with an overview of different good foods in different segments. Applaws has two categories, wet and dry food. The wet food segment has complementary foods. This is an important thing to notice, because it ultimately means that you need to feed your cat an additional cat food. The dry kibble foods of Applaws is a dietary food and can be solo-fed to your cats or in combination with the wet food by the same manufacturer. Applaws uses natural sources of animal proteins and has no grains. It does however contain a lot of vegetables such as peas. Our cats love both the wet and dry food from this manufacturer. Buying it online will save you a great deal. Orijen is trying to get as close to what mother nature offers to cat, by the use of a high number / percentage of meat proteins. While they do not use any grains in their products, there are is still a huge number of vegetables in the cat food. Cat’s don’t really need all these vegetables, so it is really a question whether this is a better product or not. To a degree these vegetables in cat food contain a lot of the minerals and vitamins in a more natural way than the usual additives. Orijen is having a lot of added taste because of the wide variety of ingredients and high meat-protein contents. Your cat might either hate it or love it. In my opinion Orijen might be more suited for outdoor cats instead of indoor ones, because the energy that it creates in your cat. Still, with appropriate dosage, this can be a good solution for indoor cats. Orijen comes in smaller bags than usual and has a high price for all the meat it contains. Raw paws offers two types of cat food, namely frozen raw meat and freeze-dried raw meat. The frozen animal products are high in all the nutrients that cats need to thrive, but as they come frozen, it is a bit more difficult to deal with. Frozen foods need to be thawed before usage and have a very short shelf-life. Raw Paws Cat Food also offers raw freeze-dried kibble. This is the freeze-dried variant of the same raw ingredients for the raw-wet food. The food does not contain any grains. The bigger problem for some people in the world is that Raw Paws Cat Food is only available in certain parts of the US and Canada. Anyone living beyond that won’t be able to buy their products. We wrote a review about Raw Paws Pet Food before that you can read here. Raw Paws Pet Food has a good pricing model for pet owners that doesn’t actually break the bank, but in the same time you have a product that requires more expertise to use it. Cats (and dogs) are very happy with this type of food, but you have to introduce the food slowly, because it can easily cause an upset stomach (rich of meat-protein). Acana advertises their products to be grain-free and having a high percentage of meat-proteins. They still stuff their foods with vegetables, mainly peas but also other vegetables are part of this food. There are a lot of different tastes, but most of these contain more than one animal, so this is not a single meat-protein food. I rate Acana as a better alternative to Orijen, which is funny, because it comes from the same factory as Orijen. Acana is in the same price-range as Orijen but has a better product that cats will love. 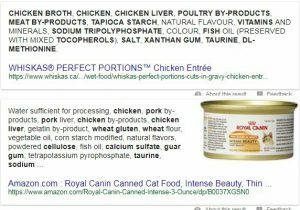 The no-grain community will hate me for it, but I do see Royal Canin still as one of the better balanced foods for cat, especially the more indoor type of cats. 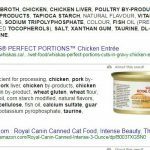 Although this product contains a lot of unknown meat-proteins and starches, it has proven through many years and long-living cats that it is a good contender in the market. Most veterinarians will still also want to advise you this type of feed for your pets, also because Royal Canin has a veterinary-only product-line. Royal Canin is definitely in the cheaper ranges for the price-point, which is not unimportant for most pet owners that also have enough bills to pay in the family. Now it is important that you check out adequate dosage of each of the above mentioned products, as this might differ on how active a cat is, their age and their weight.